Perhaps you've noticed the bright orange pops of color in fields and along roadsides? Butterfly weed is currently in bloom throughout Illinois. Butterfly weed (Asclepias tuberosa) is a native perennial that grows in dry open woods, prairies, fields, and along roadsides. Typically, it grows in a clump 1 to 3 feet tall and features clusters of bright orange to yellow- orange flowers with hairy stems and narrow leaves. Although it is a member of the milkweed family, it lacks the milky sap characteristic of other milkweeds. In fall, the flowers turn into large spindle-shaped seed pods which release silky tailed seeds. The flowers are a nectar source for many butterflies and the leaves are a common food source for monarch butterfly larvae (caterpillars). Butterfly weed can easily be grown in well-drained soil in full sun. It is drought tolerant and does well in poor, dry soils. The plants can be grown from seed but are a bit slow to establish and may take 2 to 3 years to flower. They do not transplant well due to the long taproot. 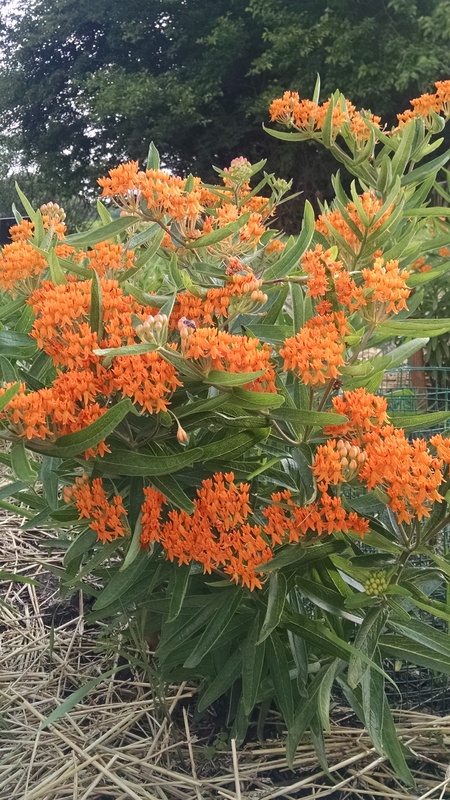 For a close look at butterfly weed in bloom, visit the Native Wildflower Garden located behind the Ostermeier house at Lincoln Memorial Garden, 2301 East Lake Drive, Springfield, IL. The Native Wildflower Garden is a project of University of Illinois Extension Logan-Menard-Sangamon unit Master Naturalist and Master Gardener volunteers.